I really think The Jungle Book, apart from the problems presented by its source material, may be in trouble. From what we’ve seen in clips, a lot of the talking animals just aren’t working. 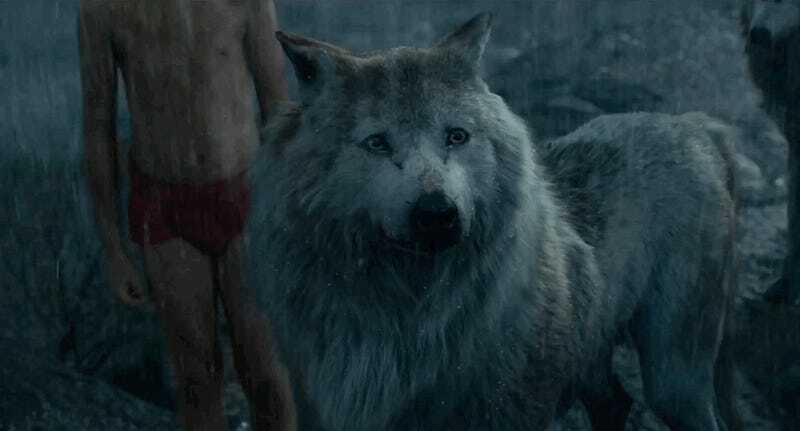 What makes these wolves so freaky, when Dawn of the Planet of the Apes works just fine? I think it’s because panther and wolf mouths are so clearly not made for speaking English. You can fudge that in cartoons where animals are given more human-like faces and expressions, but in this “realistic” CGI rendering, the animals just look wrong. I cannot suspend my disbelief and surrender to whatever the plot is because I’m so busy crawling out of my skin. Which is so startling, I fell off my chair. This version of talking animals looks more like the classic “peanut butter in the dog’s mouth with dubbed voice” version than actual talking. I can’t tell if it’s better or worse than the “we put human mouths on wolves” version of speaking animals. Either way, nightmares are going to ensue.